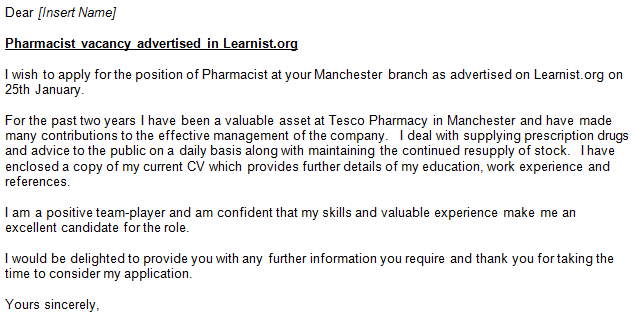 Pharmacist cover letter example. Amend as suitable and use it for your job applications. Medical cover letters are the best way through which can applicant can impart finishing touch to the resume designed for medical job openings. This kind of cover letters provides the applicant with the platform of promoting and justifying their own candidacy for a particular job opening. Furthermore, an impressive cover letter could stand out of rest and can cast a benefiting impact as well. Thus, cover letter drafted for such a profession has to follow some of the suggestible points as mentioned, irrespective of the kind of job openings for which it is intended. For such a medical cover letter either follow the pattern that is anticipated by the organisation or strictly adhere to the format based on the prevailing medical industry trends. Comprehensive and specific approach has to be followed. Highlight the underscoring competencies and accomplishments so that the recruiters could determine whether the potential of the applicant matches with the need of the job profile or not. This in turn, enhances the probability of getting selected. A right equilibrium has to be maintained between the professionalism and courteousness as this might also be contributed in creating impression. I hope that you will consider my application for the position of pharmacist you have advertised at <enter where job listing was found>. I believe that I am the candidate who has the skill set and experience you are looking for. The enclosed CV provides a detailed description of my education, interests and work experience. I can offer you my pharmaceutical skills as well as a positive and cooperative attitude I have displayed throughout my career. I understand all that is involved in holding this important position as I have the necessary educational background and previous experience working with <enter company name here>. While in this position, I learned how to perform the many duties of a pharmacist very effectively. I enjoy the many challenges involved with this role and have the skills, education and experience needed to fulfil the role very effectively. Thank you for considering my application. I would welcome a telephone call from you so that we might be able to set up an interview. I very much look forward to hearing from you.